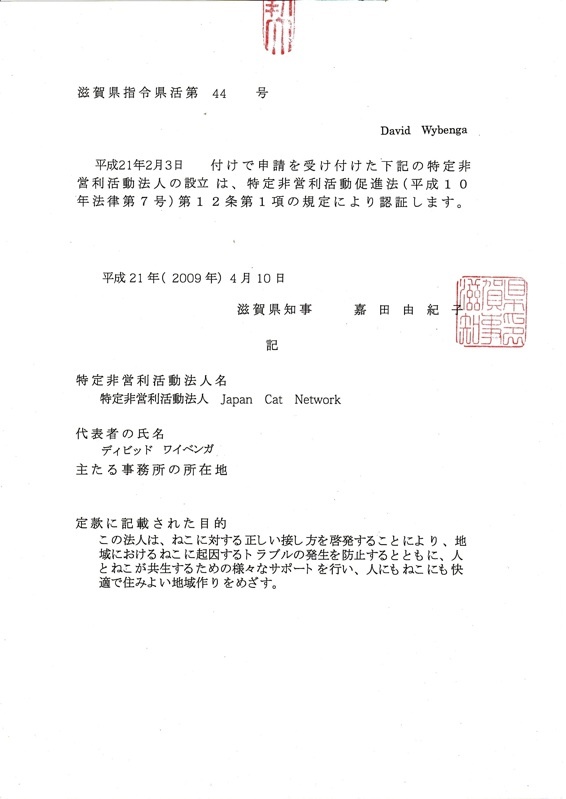 JCN was founded by two American expats, who have been living in Japan, teaching English, and helping cats since 1993.They started the group after having had success helping the cats in their own community through TNR, a method of population control in which stray cats are trapped for neutering and returned to the location. When they first arrived in town there were very sad cases of sick and dying cats, all over the community, and they found this completely intolerable. After researching, and deciding on TNR as the best plan, they got started. TNR has worked wonders in their community. The remaining cats are healthier, look better, are less annoying to neighbors, and are no longer reproducing. They realized that this could work all over Japan, and also thought how much easier it would have been to get started, if there had been a group to turn to for support. JCN is that group, and we'd like to help others who want to start TNR programs in their communities. On March 11, 2011, the Tohoku area of Japan was devastated. A magnitude 9 earthquake off of the east coast triggered a tsunami that damaged the Fukushima Daiichi Power Plant, causing a nuclear disaster. Hundreds of thousands of residents were displaced or evacuated, forced to leave behind companion and farm animals. One of the founders began working in Fukushima in March 2011 to rescue animals left behind and to take in animals from evacuating owners with nowhere to turn. The JCN Inawashiro Shelter was established in May 2011 as the focal point of this effort. It continues to serve the people and animals of Fukushima whose lives remain overturned. The JCN Inawashiro is located in the city of Inawashiro in Fukushima prefecture in the Tohoku region. The JCN Inawashiro shelter was created in May 2011 in response to the Tohoku disaster. JCN felt that a base of operations in Fukushima was necessary for rescue efforts in the radiation-evacuated areas near the 20km exclusion zone. What other people say about us? Did you had a good experience while volunteering or visiting the JCN shelter? Tell us about it!